A scroll is a rolled book form that predates the codex, or bound book. Ancient Egyptians created scrolls from papyrus reeds, but animal skin, especially parchment and vellum, and other organic materials have also been used in various civilizations and times. 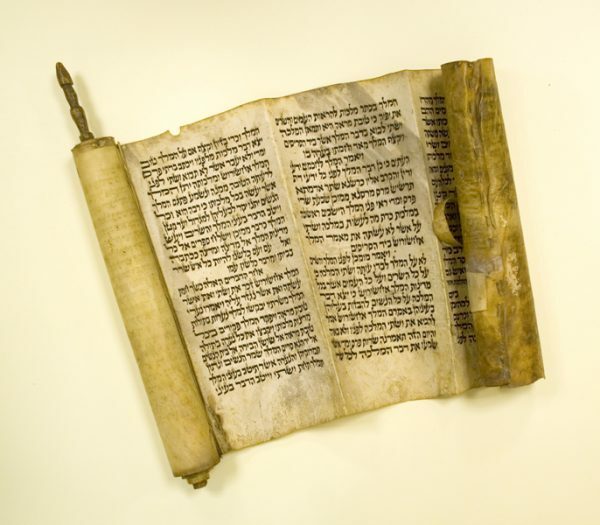 Though the codex overtook the scroll as the more common book form in about the first century CE, the scroll is a format still used in Jewish traditions. Seen here is a Megillat Ester, or Book of Esther, from the Hebrew Bible. This scroll is Yemen in origin and dates to around the 17th century. The Megillah is constructed of pieces of parchment sewn together. As with most scrolls, the writing appears on just one side of the writing surface. 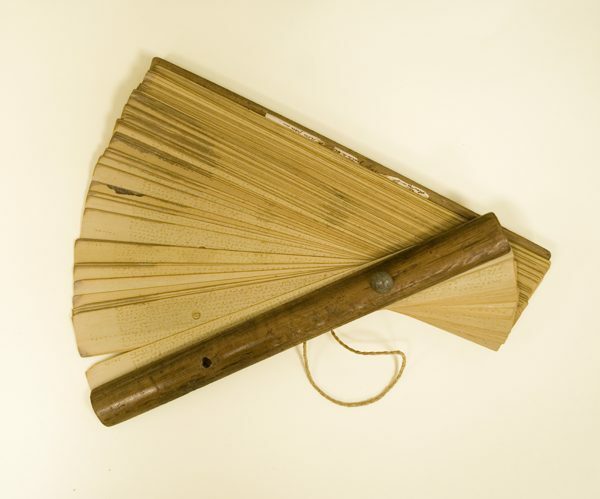 In South and Southeast Asia, palm leaves, primarily from either the palyra or talipot trees, have been a popular writing medium for over two thousand years. The manuscripts, which can record literary and scientific texts among other documents, are typically created by using a metallic stylus to etch letters into the dried leaf. The contrast and legibility of the script is enhanced by applying lampblack or turmeric mixed with aromatic oils chosen for their insect repellent qualities. Very little is known about the example seen here, though it is indicated to be a Buddhist text from Myanmar likely from the 19th century. …the art of printing, in whatever light it is viewed, has deserved respect and attention. From its ingenuity of contrivance, it was ever excited mechanical curiosity; from its intimate connexion with learning, it has justly claimed historical notice; and from its extensive influence on morality, politics, and religion, it is not become a subject of very important speculation. The revolution of printing sparked by Johannes Gutenberg (circa 1400-1468) and his adaptation of the hand-press, metal moveable type, and ink was an all-encompassing intellectual, social, scientific, economic, religious, and cultural revolution. Like the press seen in the upper left corner here, Gutenberg’s hand-press was made of wood and was likely modeled on winepresses, a connection visible here with the printing press positioned next to a cider press demonstrating their technical similarities. Encyclopaedia Britannica, or, A Dictionary of Arts, Sciences, and Miscellaneous Literature. Edinburgh: Printed for A. Bell and C. Macfarquhar, 1797. 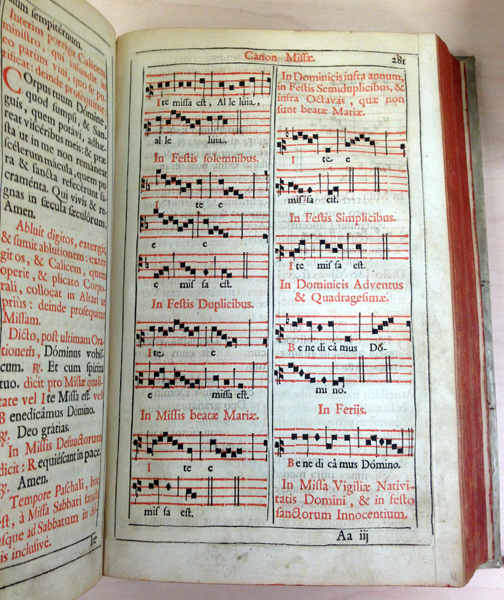 Printing musical notation began in the mid-15th century, with the earliest examples of printed liturgical music appearing in Germany shortly after the publication of the Gutenberg Bible. Early 16th century printed music placed the stem at the center of the note; however manuscript notes had stems either on the left or the right, following the scribe’s preference. Musical type mimicked the scribes practice, however in ensuring that the type pieces could be invertible the foundries inevitably standardized the side of the note the stem appears on (down stem on the left, up stem on the right) and gradually manuscript music began following the same conventions. Missale Romanum. Toul, France: Johannis Laurentius, 1671. A label, usually made from paper, pasted into a book identifying the book’s owner. The practice of marking ownership in books dates to the Middle Ages (if not earlier); the first printed bookplate dating to the mid-15th century. Ex Libris, a term often interchangeable with bookplate, is Latin for From the Books of. 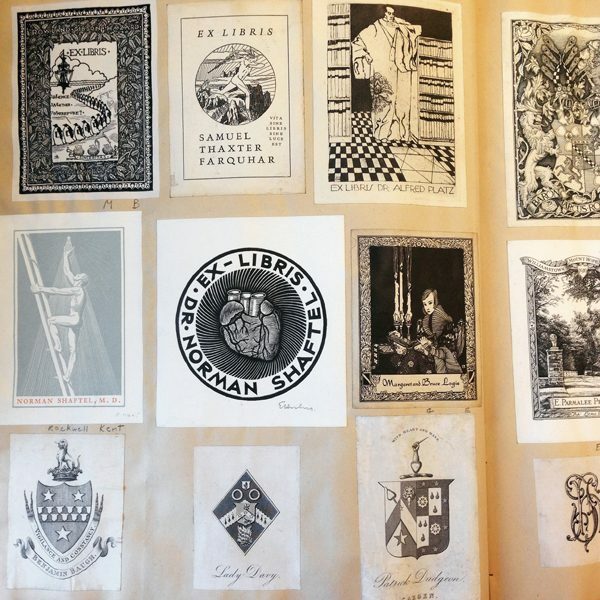 Bookplates typically bear a name, motto, device, coat-of-arms, crest, badge, or any motif that relates to the owner of the book. Bookplates are valuable tools in studying the provenance of books but have also been avidly collected as their own objects of interest since the mid-19th century. In this scrapbook of collected bookplates a variety of styles are on view, including a bookplate designed by artist Rockwell Kent. Never judge a book by its cover. 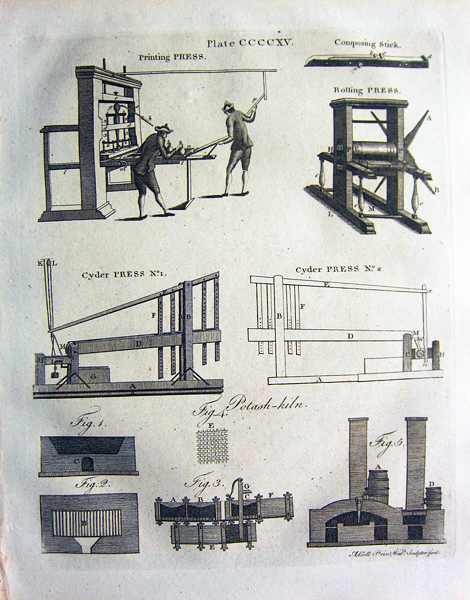 Until the introduction of mechanization to book production in the early 19th century, bookbinding was a discrete and separate process from printing. 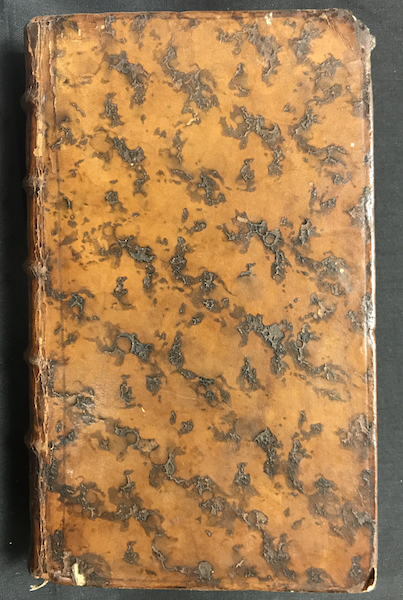 The style and look of early bindings may or may not tell us anything about the date and place of a book’s publication. 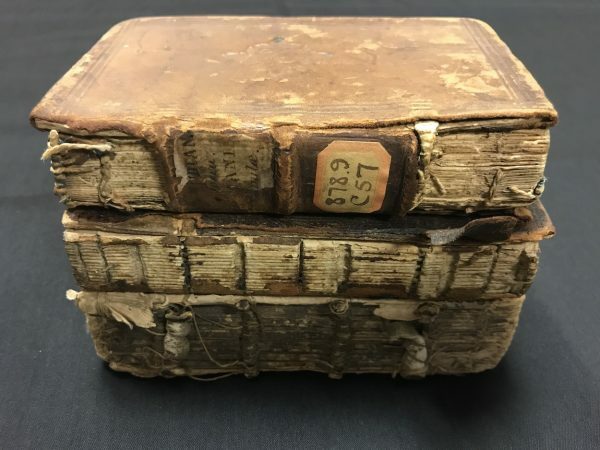 Books were bound typically for an owner or, potentially, a bookseller, but not a printer. Skilled craftsmen, practicing in workshops, crafted each binding by hand, employing simple tools and finishing the work in the fashion of the day, which was constantly evolving. Once all the sheets of a printed book were folded, the binder sewed the signatures into a text block. Sewing structures evolved over time and can be helpful in dating early books. Early books were typically sewn over raised cords, resulting in the bumps seen on many spines. By the 17th century, binders were recessing cords by carving notches into the spine. Endcaps, bands at the top and bottom of a book’s spine, were structural in the early days of bookbinding. Endcaps persist today as decorative vestiges. Seneca’s Tragoediae.Amsterdami: apud Guiljelmum & Joannem Blaeu, 1632; Cl. Claudianus, Theod. Pulmanni Craneburgii diligentia, & fide summa, è vetustis codicibus restitutus. Antuerpiae: Ex officina Christophori Plantini., MDLXXXV ; and Graftons abridgement of the Chronicles of Englande. Londini [London] : In aedibus Richardi Tottelli ..., 1572. Paper was introduced as a binding material in Europe by the late 16th century. Booksellers commonly bound books on “spec,” and they gravitated toward cheap and easy options for decorating the works. Paper bindings were initially introduced as cheap, temporary bindings, but as paper patterns developed and tastes changed, these bindings became more elaborate, more beautiful, and more permanent. At the same time, binders increasingly added coloring to augment leather’s beauty. This was an affordable, fast means of decorating. Marbling was practiced in Japan as early as the 12th century, and the process was known and understood in Persia and Turkey long before it was imported into Western Europe. By 1600, France and the Netherlands established themselves as centers for its production, and the marble paper then spread quickly across Europe. 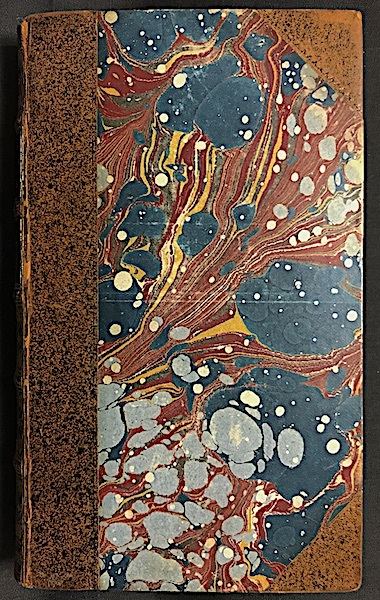 Some of the most beautiful early bindings feature marbled paper, often with a leather spine and corners to extend its life. 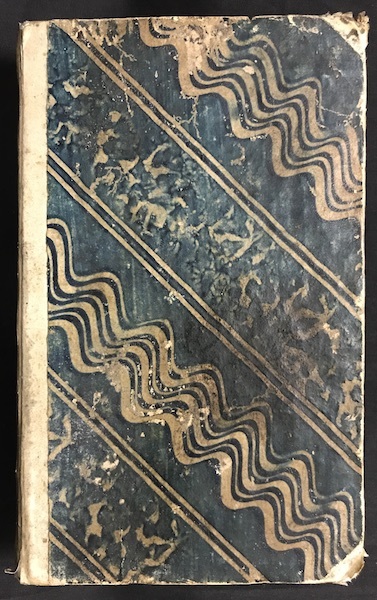 François de Salignac de La Mothe-Fénelon’s The adventures of Telemachus, the son of Ulysses London: Printed for W. Meadows ... [and 12 others], 1759.
talian craftsmen experimented with all manner of decorating papers in the 18th century. 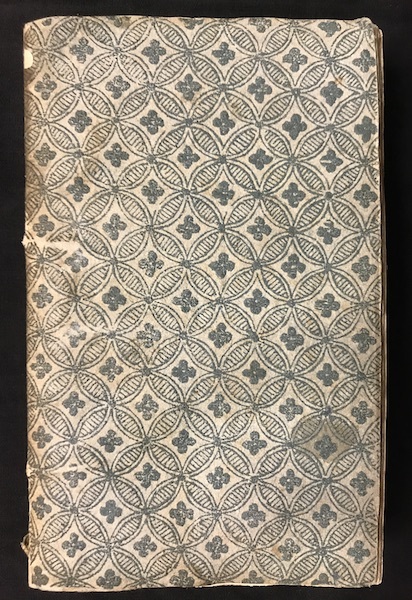 In addition to marbling, papers were commonly printed with patterns, such as this interlocking floral pattern. Didascalici del secolo XVI. Venezia : Presso Antonio Zatta e figli, 1786. Pastepaper, another common form of decorated paper, was created by mixing pigment into flour paste, brushing the mixture on to a sheet of paper, and then disrupting the surface by combing, brushing, sponging, or other means to form a pattern. Each sheet of pastepaper is unique, and possibilities for patterns and colors are endless. François de Salignac de La Mothe-Fénelon’s The adventures of Telemachus, the son of Ulysses. Iena: For Felix Fickelscherr, 1767. 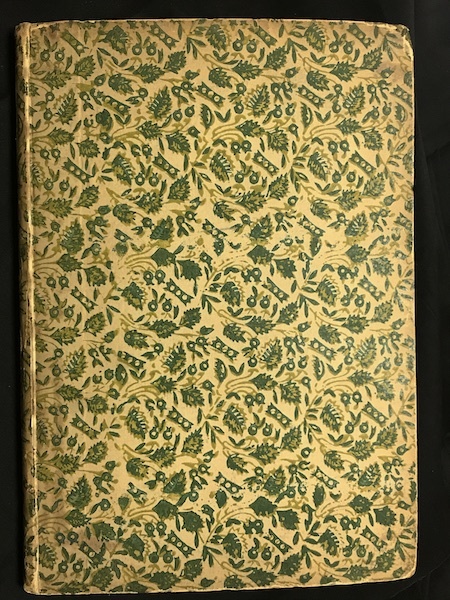 This two-color pastepaper binding almost certainly postdates the printing of this book by more than 200 years. Each color was printed from a separate woodblock, dipped in a colored wheat paste mixture, and then sequentially stamped on paper to create the full design. S. Tho. in Meteora Aristo. Commentaria. Venetiis : Apud Iuntas, 1547. Binders daubed coloring with a sponge or cloth to create pronounced patterns. The chemicals used for this process were quite caustic, and often leather burned through in areas where coloring was applied thickly, such as in this example. Lettres de M. Desp. de B* A Paris : Chez Butard ..., 1769. 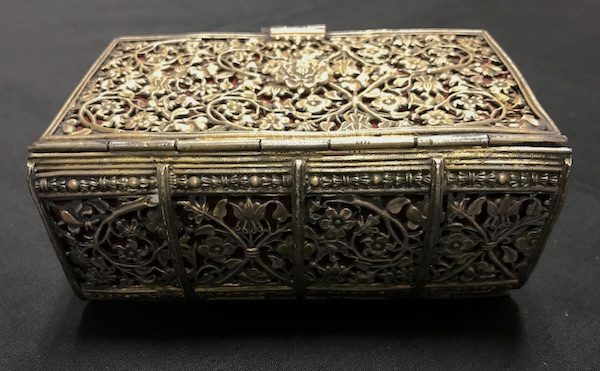 Silver bookbindings, such as this ornate example, were handcrafted in Northern Europe in the 17th and 18th centuries, almost exclusively for the upper class and to cover small, personal copies of religious works, most commonly, the Bible and prayer books. The Holy Bible. London: Printed by John Field ..., 1658.